We’re at a critical juncture in this risk rally – extension or exhaustion as you’ve heard me say and seen me write a number of times. Bit while stocks are still the biggest game in town they aren’t the only game. GBP and the GBP crosses plus USDCNH/Y are also interesting. 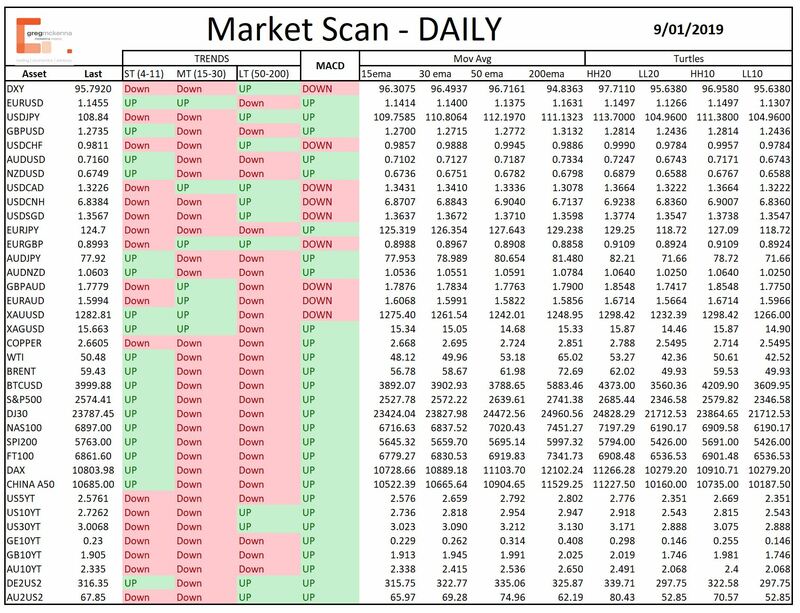 Here’s a quick run through of the key highlights and opportunities that jump out of this week’s platinum Weekend Chart Scan. Extension or exhaustion – that is where we are at with this risk rally. The easy money has been made now it gets hard. And its earnings season in the US from this week too. Much to talk about so let’s dive in. There seems to be a real message emanating from the Fed right now that policy makers want markets – especially stocks, to understand. That message is two-pronged and rests on two key pillars. The first is that the US economy is actually doing okay, better than the market carry-on of December was pricing. The second message is that with inflation staying low the fed can afford to be patient and wait and see if, when, the next move in rates will be. Associated with this second prong of the message that if necessary the balance sheet run-off, QT or quantitative tightening – may be adjusted. As a result of the latest round of jawboning from the Fed during the Asian session today the US dollar is under a little pressure today. The risk rally faltered a little bit overnight. I know I know, stocks in Europe and the US were still higher but at 2,571 as I write (10.43 pm Wednesday New York, 2.43pm Thursday in One Mile) the S&P futures are off about 25 points from the high during Wednesday’s session in US trade. That high was associated with the release of the fed’s very dovish minutes and after the very dovish action of the various Fed speakers overnight – the very ones I suggested yesterday would likely be “a dovishly supportive crowd of speakers”. With Chairman Powell and vice-chair Clarida among the Fed speakers on the Husting’s Thursday we’re likely to see more supportive comments. But the reason we might like to wonder if the rally in stocks, and thus risk assets, is getting near an inflection point is that prices for the S&P 500, using it as the bellwether, are right in the zone. If I can put it that way. time since April 2016 when the S&P was around 2,000/2,010 during December that turns the overall trend lower on this time frame. Price then exceeded my Dec 22 target of 2,500/2,523 and the subsequent further target 125 point below with the Christmas eve collapse. Subsequent recovery looks to have legs toward 2600 previous support and perhaps the 15 ema at 2,650. Daily: Bullish engulfing Friday after some small falls in Asia gave way to a solid NFP and Fed induced rally. Target on break of the week’s high on a 138.2% basis is around 2,600. Support 2,489″. Now, I’m not telling you what I told you to blow my trumpet – though last weekend’s Platinum pack did nail so many moves from stocks, to bonds, and currencies (please tell your friends, I’d like a few more clients). I don’t do it to blow my trumpet because at some point – this week, next week, today maybe – I’m going to get it wrong. Rather I raise this to highlight that US stocks – again using the S&P as the bellwether – are back at important and significant resistance levels. And they’ve satisfied my initial targets of what still is a counter trend rally. So for me that’s a place to take some money, some risk, off the table – but that is just me, I’m a cautious trader. The Russell 2000 is at a similarly important juncture. 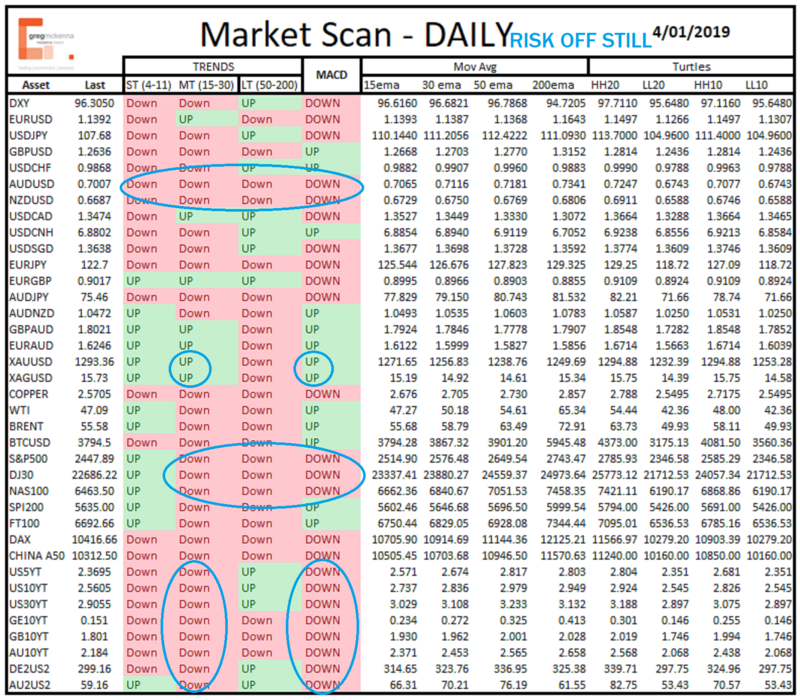 So far though – on the daily charts – other than hitting resistance and a little fall from last night’s highs on US stocks right now there is no reason to abandon the rally. But it’s largely hit the initial targets and the weeklies are still showing downtrends. But, your money management is up to you and we could get that blow of toward 2,650 in the S&P first. One market where the Fed’s dovishness isn’t fully priced in and where it is really starting to resonate is with the US dollar. I’m a longer term USD bull. But for the moment the bears have it and it is pointed down. I’ve covered my thoughts in the morning Newsletter which you can read here. But, despite some pretty poor inflation data this morning in China (PPI 0.9% versus 1.6% expected and CPI 1.9% versus 2.1% expected) , despite appalling German trade data Wednesday (yes the surplus was okay but the underlying import and export numbers were awful) the USD is under pressure again in Asia. Here’s USDCNH with an arrow pointing at the target I’ve been banging on about for week’s as Platinum and months in my own study. So the greenback is offered and while USDCNH/Y may not get to the 38.2% retracement in a hurry. If it is anything like the USDSGD or the daily USDCAD then it will grind there eventually. Just like the moves in US stocks drive many other markets so too do moves in the USD drive assets and markets – including commodities. So we need to watch this space. You can see the volatility in the MACD of this table of assets and prices…from risk off last week to risk on this week. Sustainable or ephemeral – that for me is the big questions. Only changes in the MACD today gold pointing higher again (but still needs to break Friday’s high to kick), USDJPY, which is pointing lower again, and EURGBP. At the moment I’m still treating this rally in stocks and risk as counter trend. But the reality is that It’s usually worth riding the MACD turn to see how far it runs. Just look at oil and gold recently. So you may be forgiven for thinking the the market is schizophrenic. Which is exactly what it is right now. As noted this week, the question is whether the emergence of the Powell Put stabilises the outlook for a period long enough to retest highs. Times like these, when traders are uncertain it it is an inflection, transition, or continuation, are always fraught. It is why I trade with smaller size and take money off the table relatively quickly. These are the core views impacting markets and suggesting positioning. The Fed has blinked – we can almost ignore good US data, should it come – with this backdrop. This provides a constructive backdrop for risk. China is stimulating – tis is positive too though their data is awful. There was a rush to the exit for stocks in December and they are having a counter trend rally at the moment. Bonds are likely rise further in rate. Gold and Silver are seeing their rally stall as stocks go bid – but the USD is keeping prices more elevated than I thought. Inside days a warning of the next move. Oil has broken important resistance and is pointing higher. 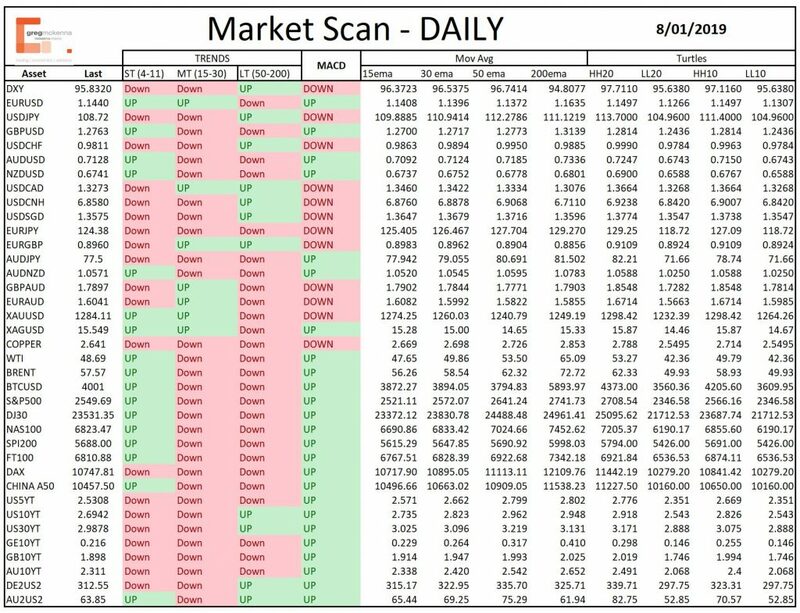 This will evolve folks and besides the chart scan it will be different each day. It wasn’t part of my original plans but I think it an important communication method for my inner sanctum of subscribers. The Information is not to be construed as a recommendation; or an offer to buy or sell; or the solicitation of an offer to buy or sell any security, financial product, or instrument; or to participate in any particular trading strategy. Readers should seek their own advice. Reproduction or redistribution is ONLY allowed with permission. Please speak to Greg McKenna to obtain same. Copyright © 2018 gregmckenna.com.au, All rights reserved. And we are still seeing risk rally. Stocks rallied in Europe and the US on Tuesday and Wednesday is a sea of green across Asian and Australian stock markets with some solid rallies. That makes sense as the Powell Put takes effect and as traders react to the fact they now think they may have overreacted in the thin holiday period. Trend indicators are still down for stocks though. But I agree with JP Morgan CEO Jamie Dimon that the next US recession is nowhere close. That may mean the Fed’s messaging changes again in the future once the data starts to improve. Indeed the Atlanta Fed has upgraded its GDPNowcast from 2.6% to 2.8% for Q4. That’s still above the US’s growth potential and so is likely to see the jobs market remain strong and unemployment remain at or below 4%. Bonds have noticed that too and they are rising. But they are also rising because risk is on and oil is rising. That in turn is feeding inflation expectations which are on the rise. So my question for you dear Platinum Members is this, at what level does the increase in 10’s back to 2.72/3% and associated moves in shorter and longer rates start to become an impediment to this risk rally. 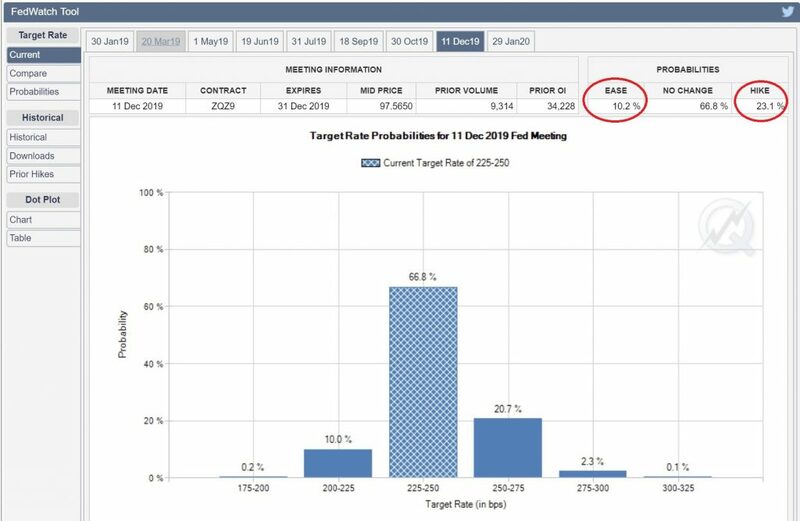 At what level of interest rates or risk recovery then drives a recalibration of the free pass – the Powell Put – that the Fed Chair has just offered US data should it print stronger than the market currently forecasts. Indeed, it’s not a big move but a the chances of a December hike are back up close to 25% with the chance of easing having been reduced in the past week. That’s still too weak an implied outlook for the US economy based on my view of growth across 2019. 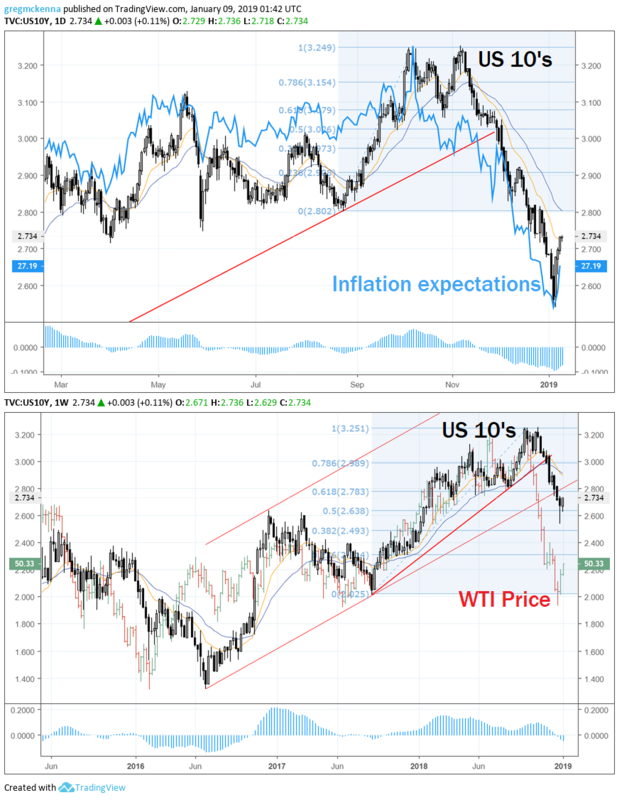 But the markets pricing is supported by and in keeping with the message from Fed speakers like Robert Kaplan, Jerome Powell, and Raphael Bostic so far in the past week. What’s important about that is in the next 36 hours we hear from Charles Evans twice, Fed Chair Powell, his vice-chair Clarida, and James Bullard – if that’s not a dovishly supportive crowd of speakers for stocks and risk I’ll be surprised. Clearly traders are betting that too as US futures are pointing higher in night trade and as Asian and Australian stocks point strongly higher. Back to my original question though. When will bond rates become a handbrake on stocks? Probably not yet and certainly not unless the 10’s rise sharply through 2.8% and back into the 2.9% and above region. Don’t rule it out, it’s just a little too soon yet. You can see the volatility in the MACD of this table of assets and prices…from risk off last week to risk on this week. Sustainable or ephemeral – that for me is the big questions. At the moment I’m still treating this as counter trend. But the reality is that It’s usually worth riding the MACD turn to see how far it runs. Just look at oil and gold recently. So you may be forgiven for thinking the the market is schizophrenic. Which is exactly what it is right now. As noted this week, the question is whether the emergence of the Powell Put stabilises the outlook for a period long enough to retest highs or at least test last week’s lows to give the bulls some confidence. Times like these, when traders are uncertain it it is an inflection, transition, or continuation, are always fraught. It is why I trade with smaller size. I think this is a better way to reflect my views in a manner you can get value from. Gold and Silver are seeing their rally stall as stocks go bid – lower levels beckon. The risk rally held overnight with Raphael Bostic, the Atlanta Fed President, saying he favours just one rate hike in 2019 and that the US economy is solid. In that short sentence you can see the seeds of the next big leg higher in US stocks and those risk appetite if the data starts to print more positively. It’s probably too soon for that at the moment with Friday’s non-farms still the only bright spot on an otherwise darkening US and global economic data flow backdrop. Indeed last nights release of the December ISM non-manufacturing, which covers the bulk of the US economy, was agina disappointing. Not weak, but softening. And as I suggested in this morning’s Newsletter it could presage weakness ahead for the overall US economy. That’s something that is constraining stocks, so while the risk on tone remains in evidence there is still lots of caution in the market and from traders about the outloor stocks as we get ready for earnings season to kick off next week. Not from the investment banks though it seems – they are bulled up according to yahoo Finance’s Sam Ro. It’s a valuation thing. And it fits along the lines of the chart I shared last week about all the bad news being priced in and maybe we were just all too bearish. But that does not mean the selling is ended. Indeed in a purely technical sense this is still just a counter trend rally. And it is interesting that Oil and the S&P 500 (as the global bellwether) pulled up at the 30 ema on the daily charts. That’s normally a sign for a trend continuation. So we’ll see how it goes tonight, but the set up is for further gains at the moment – and thus further gains for risk assets – before it, and they, stall. 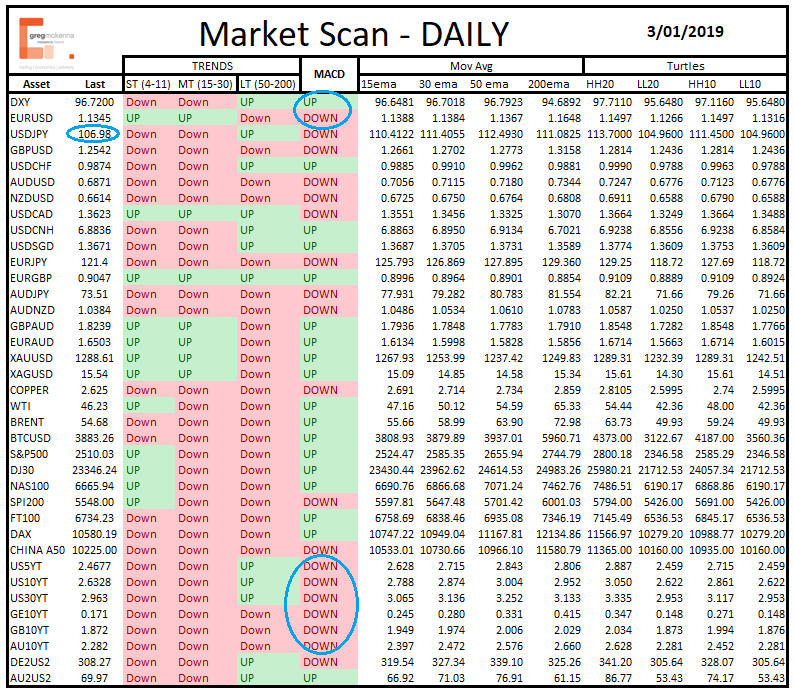 You can see in this week’s scan the shift with the turn in the MACD of stocks and bonds with Friday’s rally moving into today. A close at or above current levels would be certainly very bullish for the risk case. You’ll also note the AUDUSD and NZD are having counter trend rally indicators from the MACD as well. Copper too has turned higher after the big bounce and surge of 3% Friday. If you read this compared to Friday’s highlights you’d be forgiven for thinking the market is schizophrenic. Which is exactly what it is right now. The question is whether the emergence of the Powell Put stabilises the outlook for a period long enough to retest highs or at least test last week’s lows to give the bulls some confidence. The USD is under pressure – it has further to fall. There was a rush to the exit for stocks in December and they are having a counter trend rally – but failed at important resistance today. Bonds are consolidating recent gains – but likely rise further in rate. Gold and Silver are seeing their rally stall as stocks go bid – but had inside days. Oil stalled at important resistance but is pointing higher still. Welcome to my daily Platinum update. 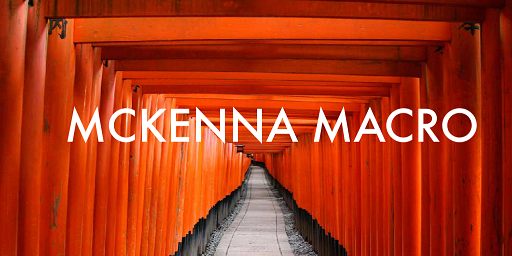 Each day you receive the Markets Morning newsletter as well as the Markets Morning video. This combination is meant to build on the weekend work I do – and you recieve – in the weekly chart scan pack. 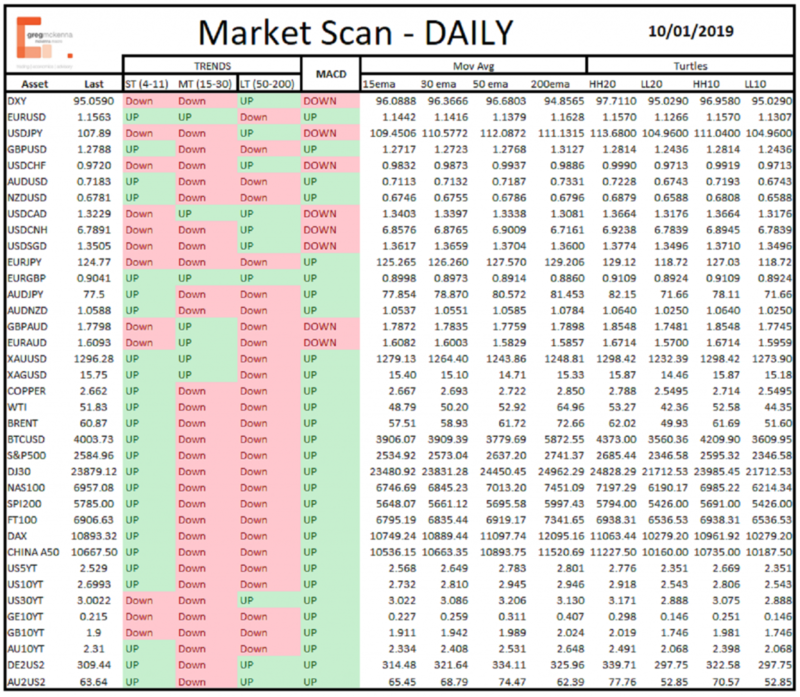 But I each day I also want to share with you the daily screen of the main markets I cover as well as any updates and thoughts on specific markets space and time doesn’t allow in other venues. HERE’S the link to Vimeo with the video embedded below. 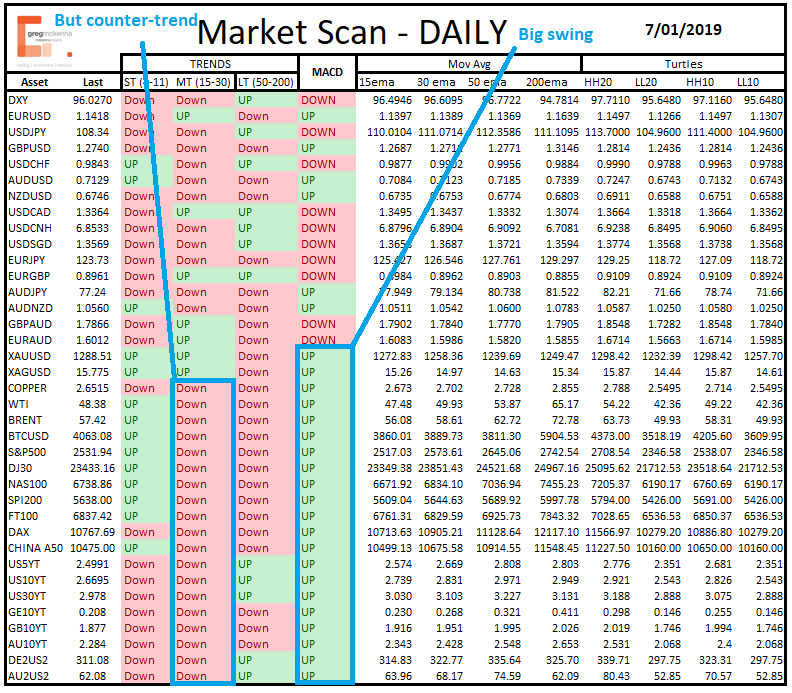 Otherwise you have a feel for what I’m thinking right now – counter trend rally which might have some legs left to test the resolve of the stocks and oil bears, the USD bulls, and the bond buyers. Last week I mentioned on numerous occasions the volatility in the market overall and then again in the swings in sentiment and indicators like the MACD. That cost me money Friday when the S&P 500 signal was about 100 points wrong with the sell signal. Small position, 3 grand dusted. But you can see in this week’s scan the shift with the turn in the MACD of stocks and bonds with Friday’s rally moving into today. A close at or above current levels would be certainly very bullish for the risk case. You’ll also note the AUDUSD and NZD are having counter trend rally indicators from the MACD as well. Markets have had a wild ride since my last full weekly scan on December 22 and 23 last year. We’ve seen collapses in stocks, a huge bond rally, a flash crash in currency markets last week and it’s all been enough to make the Fed blink and give a clear signal of support to the markets. That’s what we saw from Fed chair Powell Friday. The Powell Put is alive and well and it’s a short term game changer and may be important longer term. Having performed this chart scan and taking into account the solid non-farm payrolls, Fed Chair Powell’s obvious nod to stock market weakness Friday, but more specifically to the charts included in this pack the question of strategy and tactics is relevant. I say that because many medium term trends remain lower (strategy) but daily and weekly MACD’s are signalling a reversal of recent moves. Thus I am expecting a risk rally in the week/week’s ahead. The evidence for this seems to also be apparent in the divergence between correlations on the 35 and 95 day sets (risk aversion) and the broader dispersion and weaker correlations over the past 20 days. Holidays may have disrupted this naturally but it is worth noting. Globally though, save for non-farms on Friday in the US the evidence of a slowing global economy continues to mount. So there are still risks on this front. But the blow offs in moves during the holiday period and the flash crash in forex last week may have lessened the impact of this. So I am surprisingly positive on the outlook for risk assets as I write this at the end of the chart scan. This may not last, volatility increases during down markets for stocks. So it is a question of strategy or tactics and your approach to trading. The US dollar is under pressure. Still above the key closing levels of 96 and 1.15 for DXY and Euro moves in rates like the Aussie, CNY, SGD, and CAD suggest a chance of a range break. Watch that space. Break of 95.45/60 in DXY terms would be a big signal. The clean out associated with last weeks yen induced flash crash and its related impact on the Aussie and Aussie crosses suggests some further room for retracement here on the risk proxies, especially given the Fed/Chart outlook for stocks. USDCAD is a t a critical juncture and along with USDSGD and they are my USD canaries. Gold and silvers rallies look in hiatus as stocks turn and risk goes bid. Sentiment is ephemeral at present and prone to swings but charts suggest retest of support. Copper bounced nicely off range lows along with risks, plus bond sell off and this combination fits with the more positive narrative. Oil looks to be building for a powerful rally if near term resistance can be bested. The collapse and bounce between Christmas and New Year in the US and other stocks markets was tested this week but stocks have come back strongly and look to be pointing almost universally higher toward break down and resistance levels. Volatility increases in down markets so these rallies may falter medium term but for the moment each market covered has some key levels to watch. Crucially for me Apple bounced off important support – a level I had targeted as such – during the week which helps the Nasdaq and broader market sentiment. The Powell put is alive. That might just be enough to reinforce the “buy the dip” mentality we’ve seen emerge since Christmas eve. Here’s a little intro video from me to you, my Platinum readers – for those who haven’t seen it yet, the new members. The FT reports that AQR founder says blaming quants for market turmoil is ‘insane’. AQR – the quant fund in question – manages USD226 billion and founder Clifford Asness says 2018 was a “crappy” year. But what Asness misses – like the man with matches who says he didn’t start the fire – is that its not necessarily Ray Dalio’s “all weather” fund or Asness AQR which might be the cause of the recent volatility – macroeconomic changes and trade wars have played a significant role. Yet, IT IS the automation of trading and trading strategies which have made a difference, to the S&P volatility Christmas Eve, Japanese markets on Christmas Day (they were open naturally as it was just Dec 25 in Tokyo) and subsequently and the Yen and forex flash crash yesterday. Let me explain why automation is an issue via a Minsky/Mandelbrotian take with a behavioural overlay I’ve had for years. We know via these two great professors Hyman Minsky and Benoit Mandelbrot that both stability breeds instability and that volatility clusters. We also know that we transition through these two regimes. Behaviourally, when it is human traders, investors, and fund managers doing to transactions these periods of acute volatility usually lead to position size reduction, volatility matching, and players moving to the sidelines. That makes things more unstable for a time (volatility clusters) but ultimately as these traders make the rational move to sit things out we see the seeds in the reduction of volatility that eventually follows the volatility expansion. BUT when the robots and automated trading systems keep pushing, don’t get turned off, and – as I tweeted after the Nikkei’s big Christmas day fall – continue hunting, then the necessary and natural circuit breaker doesn’t occur. It’s why at the end of last year I wrote the years volatility hadn’t been unusual by my measures but the last 6 weeks or so was. 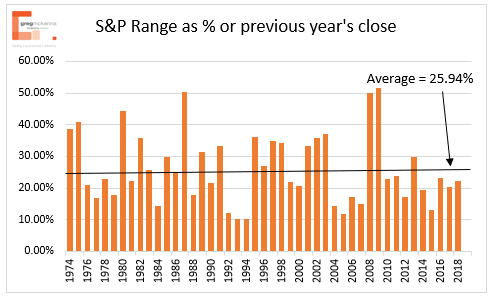 The S&P 500’s yearly range as a percentage of the previous years closing price. So Mr Asness, it may not be your quant fund causing all the ructions, but it certainly is the automation of trading. As Phillippe Jabre wrote when he closed his fund in 2018, “financial markets have significantly evolved over the last decade, driven by new technologies, and the market itself is becoming more difficult to anticipate as traditional participants are imperceptibly replaced by computerised model”. It is however still possible to understand the models and read the markets, as I think readers of my newsletter will attest. To my chart of the day then and I have so many to choose from it’s difficult. 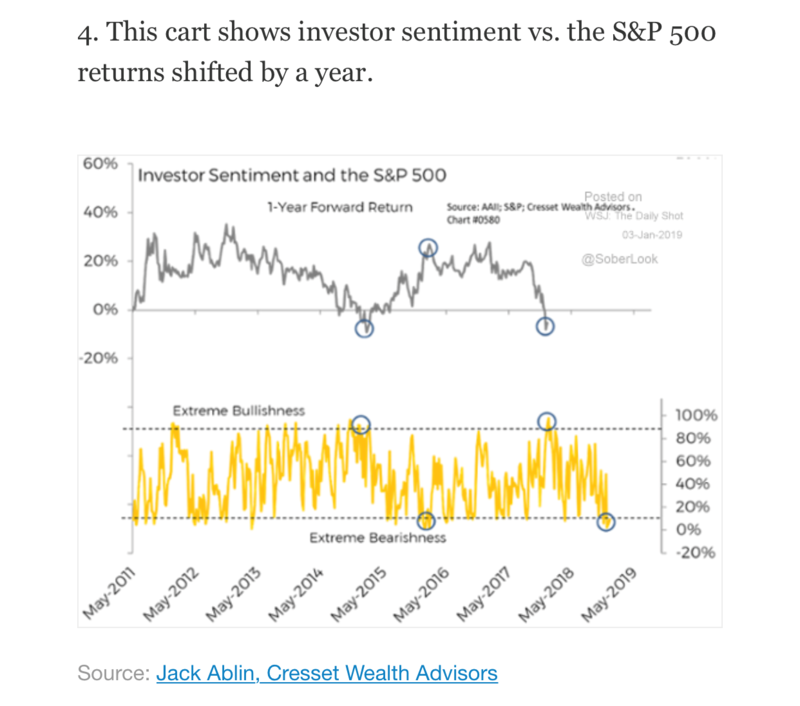 The contrarian indicator for a 12 month buy on stocks – and thus sell on bonds and other assets from this morning’s newsletter is probably the most important one to keep in mind. For when we see the pessimistic crescendo in stocks.That will then inform other asset classes as well. But for the moment the S&P 500 futures based CFD is probably the most interesting specifically because of all the linkages to and through it from other asset classes. I received a sell signal this morning and now have a small short on stocks again. Now I’m not an Elliott Wavician. But there is a coincidence between my Fibo charts and the waves as you’d be aware. So there is a chance that while below the 2500/2535 region that a retest of the lows and possible break to the 138.2% projection of the last move is on the cards. That would target 2,180. For the moment I’m just riding with the MACD signal (stochastic was above 70) and seeing how it goes. Update on other thoughts. Gold and Silver are still rallying, bonds have broken lower, and the yen still has a bid. This is a risk off environment folks. Kevin hassett may have misspoke on Thursday so expect some effort at positive spin from the Administration on trade if stocks get funky on Friday – especially with the all important non-farm payrolls to be released. I’m never comfortable when markets become too correlated. But as you can see in the Aussie and Kiwi trends and MACD, in the US stocks, in bonds, and in gold and silver’s moves this is a risk off market. But, as I As I noted this week China and global growth are the main drivers. Can better services PMI’s outweigh the worry about manufacturing? It’s also a little volatile as we’ve seen in currency markets and the reversal of stocks again. Thus the USD index has switched on the MACD. But. the reality is that we continue to trade a range for these two – 95.50/97.70 and 1.12/1.15. Consider those levels the floor and the ceilings for each asset.Short term a break of 1.1295 for EURUSD could kick things off. Along with the AUD and NZD pointing down still, copper is lower again though it did bounce of the lower bound of the range. Watch $2.53/55. A break would be decisive. WTI, Brent, and stocks are still in MT downtrends but the MACD has pointed to countertrend rallies. Today may be make or break day for these counter trend moves. But no signal yet. US 10’s are still pointing lower and have been joined in that directional move by a broader subset of global bonds now as growth concerns increase. Volatility remains elevated at present, as this mornings moves in the USDJPY, AUDUSD, USDTRY, Apple and others highlighted. I’ve seen and lived through these types of moves so many times I kind of under reacted this morning. But for those who aren’t comfortable with these moves its worth noting as I did in the video email that position sizing is important. Also I think this tweet from Ryan (ForexFlow) and the Yukster’s response are perfectly pitched and exactly what I was going to write here this morning. 1. Is there any real basis for this, or has it become temporarily unmoored? 2. Can I take the volatility that’s sure to accompany even a good entry? 3. What price tells me I’m wrong? 4. Then, and only then, trade, likely with a reduced position size based on 2 & 3. What is important here is that you need to be looking at the bigger picture all the time. That’s why in our Weekly chart scan I look at monthly, then weekly, then daily charts. Context is everything. it is also worth noting that you can use my process, the way my charts are set up and comfortably trade any time frame you like – I’ve traded gold at a one minute time frame using my setup successfully. To my chart of the day then and I can’t go past USDJPY on a weekly basis. In my video yesterday and today I noted that if 108.48 broke then “as ludicrous as it sounds” we’d be trading down into the 104’s”. But I didn’t expect it to happen a few minutes after I mentioned it in today’s video. It was an incredible move for one of the most liquid currencies in the world even if Tokyo is mostly absent. Anyway the broader context is that the JimmyR trend is about to turn bearish on a weekly basis, remains bearish on a daily basis, but has climbed back inside this weekly wedge pattern. A weekly close below 107, the lower line, would get the attention of the bears. Importantly, while below 107 would set up a big fall it is a move below the 104.60 region – today’s low was not far from that level – that would speak to deeper issues in markets more broadly. As with today, I respect levels unless or until they break. Update on Silver – the shenanigans in USDJPY and forex more broadly helped Silver stay bid and it is at $15.54. So I’ve missed my opportunity for now and will wait to see if it back to the break out zone $14.90/95, perhaps the 15 ema at $15.04 as the key level of support at which time I’ll evaluate how it looks and enter long (or not as may be the case). A trade below $15.31/32 would suggest that pullback is in the offing. And, as I noted in the morning Newsletter the US 10’s are on the cusp of a big break lower. If you haven’t seen the 10’s chart and commentary in the Markets Morning Newsletter you can see it here. Part of that volatility in markets is that the USD index and Euro have switched in their daily outlook. But the reality is that we continue to trade a range for these two – 95.50/97.70 and 1.12/1.15. Consider those levels the floor and the ceilings for each asset.Short term a break of 1.1295 for EURUSD could kick things off. Note the weakness this morning in USDJPY hit the Aussie, Kiwi and GBP after they’d already had poor days Wednesday. AUD and NZD in particular are pointing lower. I’m seling rallies on these two after closing my AUDUSD short this morning. Along with the AUD and NZD pointing down still, copper is lower againafter a weird rally in Asia yesterday. $2.55 is the level to watch (see the implications of lower copper in the newsletter today). As I noted yesterday China and global growth folks is what I reckon is constraining these in a weaker USD world. Gold and silver have seen turns in the JimmR and MACD suggesting the risk aversion play is a weight too.